I am confused whether to take Science, Commerce, or Arts after 10th? Should I pursue Chartered Accountancy or Company Secretary? Do I have the aptitude for Architecture or Designing courses? What is more suitable for me - MBA in Marketing or MBA in Finance? Should I take Computer or Mechanical Engineering studies after 12th? If you are facing similar career queries and are confused about selecting your right career, why not take assistance from Career Nurturer’s - CAREER DISCOVERY process (i.e. Psychometric and Aptitude Assessments + Career Counselling and Guidance)? What are Psychometric and Aptitude Assessments? Psychometric Assessment Tests are scientific and standardized assessment tools that help you understand and assess your skills, aptitude, interest, emotional intelligence, motivation and personality traits. Aptitude and Psychometric Tests are of great assistance in your career selection and career planning process. These assessments help you understand your true calling, and assist you in making the right career choice. Who should take Psychometric and Aptitude Assessments? School Students (Class 8th): To decide subjects for class 9th in ICSE and IGCSE boards. School Students (Class 9th and Class 10th): To decide on your stream after 10th - Science, Commerce or Humanities/Arts. Junior College Students (Class 11th and Class 12th): To decide which course/career to opt after 12th for graduation studies. Students pursuing Graduation: To decide which specialization to pursue after gradation studies. Graduates and Freshers: To evaluate their career goals and future career growth prospects. 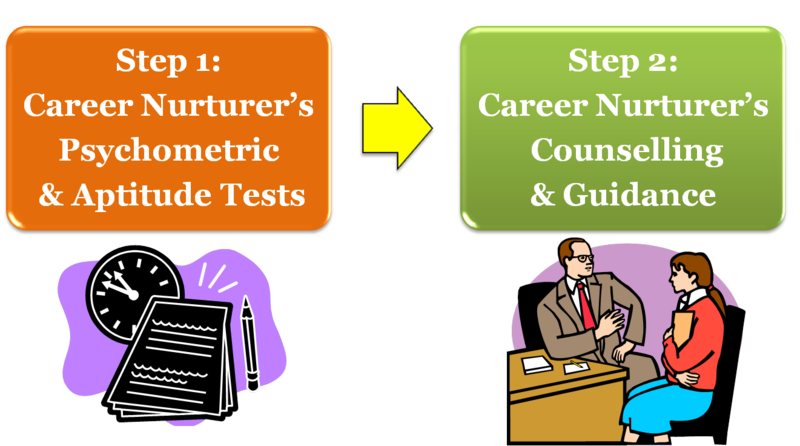 Which Psychometric Assessments are conducted by Career Nurturer? Aptitude Assessment: To understand your aptitude and abilities over parameters such as verbal ability, numerical ability, logical ability, spatial ability, mechanical ability and clerical speed. Interest Inventory: To evaluate your interest (i.e. likes and dislikes) across various career fields and occupations. Personality Assessment: To get an insight into your personality traits over different personality qualities such as adaptability, competition, enthusiasm, social warmth, leadership, motivation, mental health, maturity, self-sufficiency, boldness and sensitivity. Emotional Intelligence Inventory: To assess your ability to understand and manage emotions of yourself and others. How is CAREER DISCOVERY process conducted at Career Nurturer? What are the Benefits of Career Nurturer’s CAREER DISCOVERY Process? The psychometric tests used by Career Nurturer for evaluation are standardized and scientific assessments. 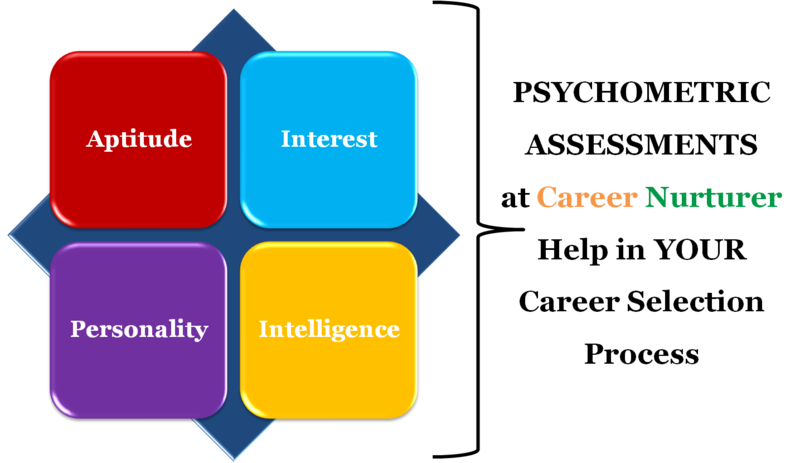 Career Nurturer conducts a battery of psychometric assessments that help in understanding the student’s aptitude, interest, personality and emotional intelligence. Our Career Counsellors are certified psychologists / psychotherapists / counsellors who guide the student in selecting the correct career path. The counsellor also provides detailed guidance on specializations, courses, entrance exams, job avenues and future scope in various career fields. Career Nurturer has no tie-ups or associations with any type of institutes or coaching classes; as we believe in providing 100% UNBAISED CAREER COUNSELLING AND GUIDANCE.